Paws are an incredible asset to a dog. They allow the animal to feel the ground beneath them with each step to determine if there is a solid footing and any danger lying below. They have a fleshy component that helps to dissipate heat and regulate body temperature. This same flesh acts as a shock absorber for the rest of the body. Hair helps to protect the paw and nails ensure a firm grip across a variety of surfaces. In a controlled environment, typical paw care only involves the trimming of nails (they should be kept short enough so they just touch the ground when the animal is flat footed. Always to care not to trim nails too short and cut into the quick – which is very painful to the dog) and hair around the toes and pads. Extreme weather is another story. 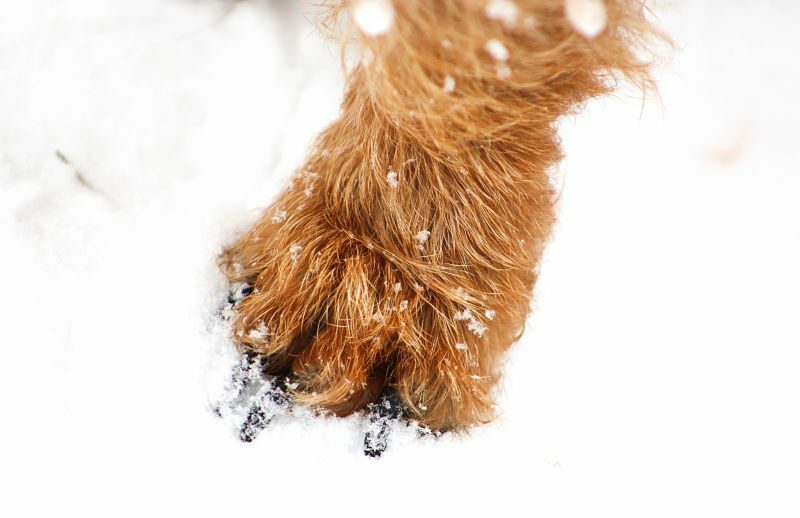 When a dog is exposed to an environment that is too cold, too hot, or altered with chemicals the feet can suffer from dryness – or worse – frost bite or burns. Logically, boots or shoes seem to be a good choice to protect an animal’s feet. However, these can be dangerous to an animal as they do not allow the paw to function as nature intended. A better choice is to use a paw protection wax. A good wax will both nourish and condition the foot to keep it from drying, but also create a thin, invisible barrier between the pads of the paw and chemicals (like salt for melting snow). Quality waxes also have micro-particles that help with traction in slippery environments. A great choice is Primo Pup Vet Health’s Paw Pad Shield. To use a paw pad wax, apply to the paws prior to exposure to an extreme environment. Always remember to wipe the animal’s paws when returning indoors to remove any chemicals that have collected on the animal’s feet. Now go out in the snow and play!